If I ever buy a house that requires a real reno, I will definitely add a hot water tap to my outdoor piping. My parents did so when they did their renovation, and it is soooo useful: washing the car, rinsing out a cooler, filling the kiddie pool.....no more frigid hands! This is an expensive add-on if you're not doing a reno, but if you're adjusting plumbing anyways it's a simple feature to include. Here are a few pictures from my parents' back garden (in Vancouver). Everything is so lush here; quite a difference from the Ontario drought! Yesterday we headed to Locarno beach in Vancouver and collected some beach glass and driftwood. For our post-nap craft we glue gunned the soft pieces of glass onto the cedar. It is now sitting on a plate stand on a shelf in Grandpa's office. Perfect...except for when my daughter's fingers got caught in the hot glue. Yesterday while the kidlets were napping my mom and I hit the local Sally Ann. The prices were a bit higher than my Toronto Goodwill, but I still managed to scoop some deals: 3 vintage necklaces and a funky patterned Eaton's bed sheet which will be transformed into fabric gift bags. Paired with some decadent ribbon from Mokuba, they will be gooooorg. Today we are headed to a thrift store run by the airport that sells all the lost and confiscated goods (firearms and drugs excluded, I'm assuming). Word is that it's $5 for as much as you can put in a shopping bag! Today my mom and I did some cross-border shopping with the kids. 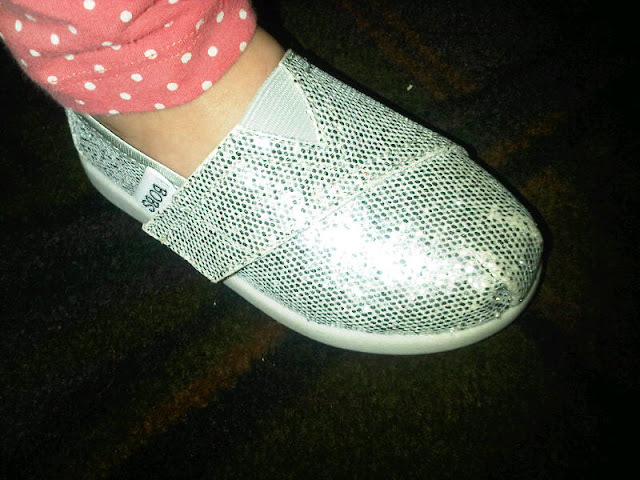 I picked up these shoes for my daughter - they are called "BOBS", and are made by Sketchers. They look mysteriously like Tom's, and similarly give a second pair of shoes to a child in need....but I think these are cheaper....am I bad to buy the cheap brother of feel-good charitable shoes???? I am in Vancouver for a few weeks with the kidlets, visiting with my parents and brother. I snapped a picture of this display in a kitchen store in Kerrisdale village, near my parent's pad. It makes me want to decorate with more colour!! 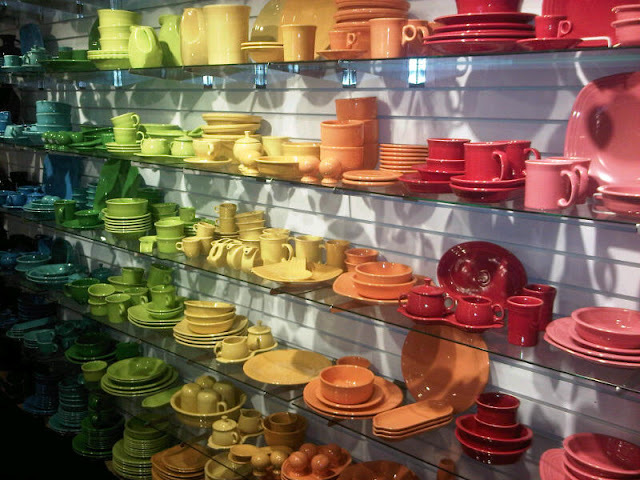 How fun would it be to have a set of rainbow dishes? I have long been trying to figure out a fun way to display some of my daugher's art. Today we took two cool knobs that I bought at a Zara Home store (in Barcelona - it was amazzzzzzing), afixed them to the wall (with special plugs for screws) with a satin ribbon in between, and hung some art using colourful clothes pins from Dollarama. Colourful, cheap, personal, and easy. I love it!! But I wanted to share a new super easy, super tasty recipe...I'm not even sure it can be called a recipe, it's so simple. Take salmon, hot or cold, and top it with grainy mustard and horseradish. Woohoo! It's got zing, and the flavours match beautifully with salmon. Enjoy the salmon, and bask in the glory of having only 2 spoons to wash after dinner. I'm in like, not love, with my new headboard. For a long time I have lusted ove the Crate and Barrel Collette headboard....but it is way (and I mean wayyyyyy) out of the budget. I inquired about having one made by my go-to upolsterer, which was going to cost about $800 if I wanted the nailhead detail (which I did)...this seemed more reasonable, but still expensive for a room we don't spend much waking time in. So I opted for one off Craigslist that I like but don't looooove.....and I'm totally comfortable with the compromise. It was only $50 (start the car!) 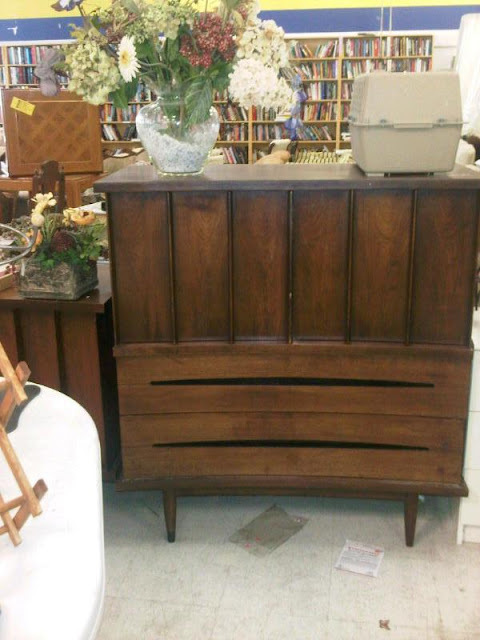 and is a beautifully stained dark hardwood with a vintage circular design. If I ever win the lottery I will go get that Collette headboard and not look back...after all, I am sure I can sell this baby for at least $75 on Craigslist next time around! What do you think? Does this work well enough? (and yes, that is 50 Shades of Grey on my bedside table....so far (up to pg 73) I'm pretty underwhelmed). Yesterday was my husband's birthday. Pre-kids, we would have celebrated at a fun new restaurant. Things have changed a lot since then, but I think it's for the better! This year I had our bikes outfitted with seats for the kids and we hit Carter's Ice Cream, just off the Danforth near Coxwell. It is an adorable shop selling Kawartha dairy ice cream (yum!) with pint-sized adirondacks for the kids outside. Bike ride + ice cream = the perfect family night. Last night I made this delicious summer salad. It is among the most interesting flavour combinations you'll experience, and is oh-so-easy to prepare. Toss with olive oil and balsamic. Salty and sweet, refreshing and creamy. This salad has it all. My husband and I have a competitive group of friends. ....very. competitive. So as incentive to get healthy, we are embarking on the Fatty Get Skinny Couples Challenge (our own creation), beginning tomorrow. The rules are as follows, but in essence points are gained for exercise and lost for food infractions. The challenge runs until September 9th, when we will all celebrate at Hy's Steakhouse. The losing couple pays for 40% of the bill; 4th place couple pays for 35% of the bill, 3rd place couple pays for 25% of the bill, and the first and second place couples split the tip! - At end of competition, additional points will be awarded for weight loss at a rate of 1 point for every 2% of initial body weight lost. Let me know if you want the Excel point tracking sheet I created and you can start your own competition! Yes, I have OCD.....and I have no desire for recovery. I revel in it. Check out the 'ribbon' drawn in my newly purged office. ...more photos to come now that the purge is complete. Now I can't wait to wrap a gift! This weekend we were supposed to go camping with a group of friends, but we decided not to as there were thunder showers...not fun with kids! Since my husband and I were on point for dinner, we just relocated the troops to a friend's house. This Toronto Star article about the plummetting price of lobster inspired me to cook some live ones with corn on the cob! The plan was to boil water over the camp fire, but they tasted just as good over a gas range! The cheapest lobsters in the city that I could fine were at T&T Supermarket down in the portlands...if you haven't been, you should...it's famtastic: great produce, cheap milk, and tons of asian specialties, from dumplings to Peking Duck. Lobsters were a bargain at $8.99/lb! Do it! I need a second house! Do you like mid-century modern furniture? If so, this post is for you! 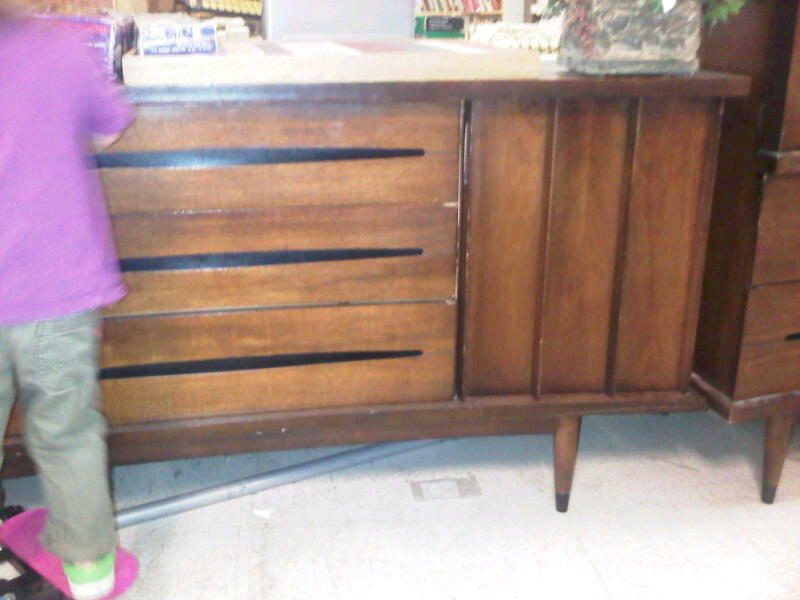 I just spied this gorgeous set at the Goodwill on Overlea - $65 for the hutch and $75 for the buffet--start the car! 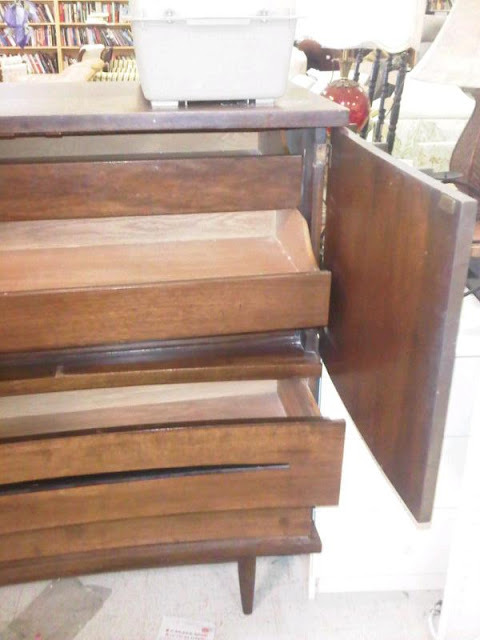 The set is in excellent condition, has a TON of drawers, a heart-stopping curved front on both pieces and no knobs (clever wood in-sets for opening and closing). It's a gem. I tried to convince my sister to buy it, but no dice. 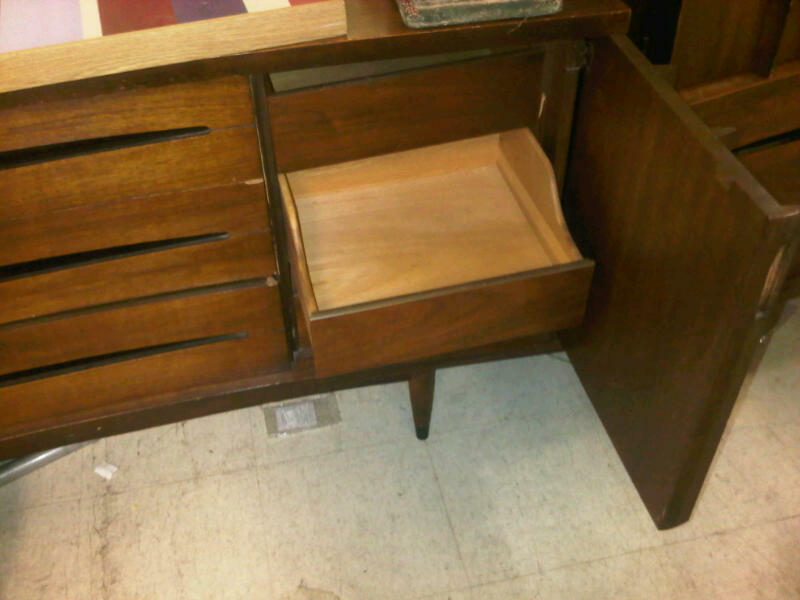 These pieces would be hundreds, if not thousands in any of those vintage Queen East boutiques like GUFF. Did I mention that this is a great deal???? My dream job would be wasting away hours at the Goodwill, scavanging and refinishing cool furniture....oh, to dream. Is there anything worse than bathing suit shopping? Change rooms without mirrors, forcing you out into a public area? Racks and racks of bathing suits? After I had baby #1, my friend Erin recommended that I visit Melmira at Yonge and Lawrence in Toronto. Best. advice. ever. You never see a rack of bathing suits. ...that's right. Your consultant talks to you about what you want and brings you a few suits at a time until you find the perfect bathing suit. It is pricey, but worth every cent. I walked away with two suits that I love and still wear. UPDATE: Janice made a good point in her comment that I forgot to mention - the bathing suits Melmira carries are all sold as 'seperates', so you can get different sized tops and bottoms. Also, both the tops and one piece suits are sold in bra sizes - like 36C - so they really fit well. As I blogged about here, our street planned a block party this year. We held it last night, and it was really, really swell! We had a fantastic turnout (about 40 adults and 15 kids) and it was a snap to organize (we kept it very simple for our first go at it!)! Today my husband took the kids out, so I had a chance to tackle another room with my purging paws: my son's nursery! I went through all of my son's clothes. Too-small items were packed away in sweater bags, while others were destined for the Goodwill or my garage-sale pile. I followed up by giving the room a much needed cleaning. I started this blog on my second maternity leave to document some of the fun and interesting 'goings on' at our house....it was also in response to my brother in Vancouver lamenting that my regular email updates were filling up his inbox with large photo attachements.